… you shouldn’t act surprised when people say they don’t know something. This applies to both technical things (“What?! I can’t believe you don’t know what the stack is!“) and non-technical things (“You don’t know who RMS is?!”). Feigning surprise has absolutely no social or educational benefit: When people feign surprise, it’s usually to make them feel better about themselves and others feel worse. A key trick here is to not act surprised even if you’re actually surprised. (because whether you’re performing surprise or just genuinely a bit surprised, it has the same negative effect!) I’ve gotten better at not acting surprised over the years when somebody doesn’t know something that I expected them to know, and I’m happy to have practiced it. Like a while back my cousin was like “the internet travels in cables under the ocean? are you serious?” and I got to tell her YES COOL RIGHT and talk about how internet packets go across the ocean! (like this video of a shark attacking an undersea cable). 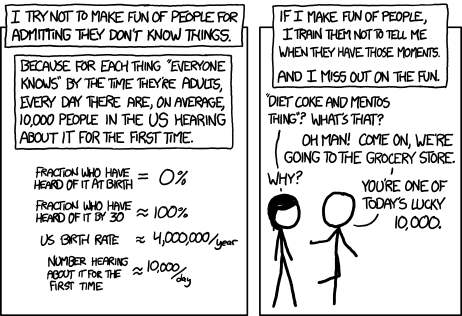 There’s also a nice xkcd with basically the same message: Ten Thousand. 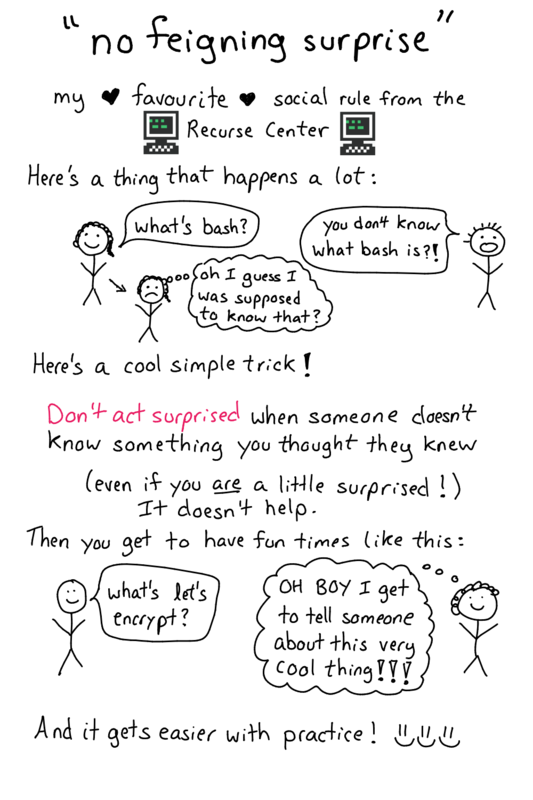 The fish shell is awesome New zine: let's learn tcpdump!